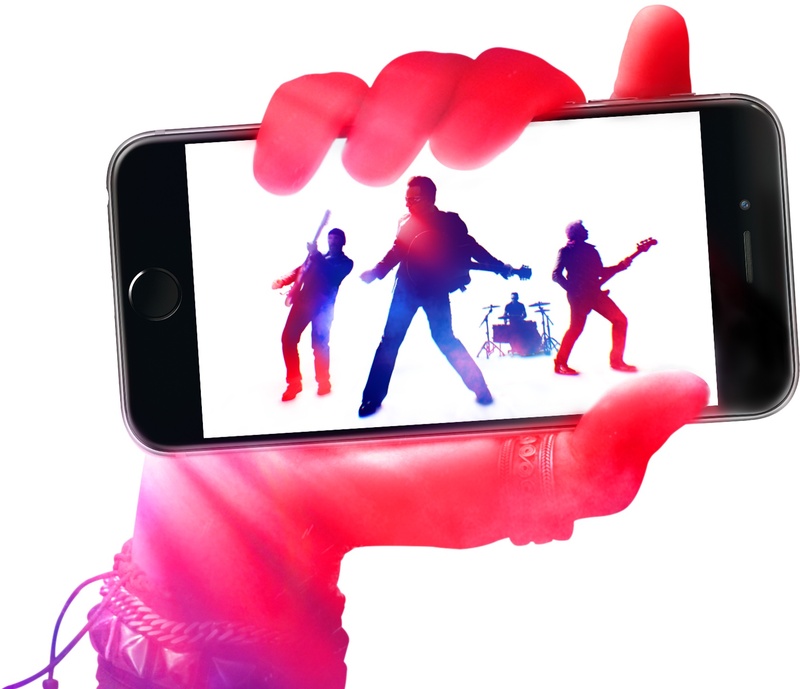 Apple wrapped up yesterday’s presentation by inviting U2 to perform onstage and announce that it will be giving away the band’s latest album, titled “Songs of Innocence”, to iTunes users completely free of charge, no strings attached. During the exclusivity window which closes October 13, iTunes user 13 or older can grab their free copy of the aging rock band’s album. Company CEO Tim Cook called the deal “the largest album release of all time” and here’s how you can grab your free copy right now. The album features eleven new songs from the band and charts their earliest influences from 70s rock and punk rock to early 80s electronica and soul. It’s been recorded in New York, London, Los Angeles and Dublin and produced by Danger Mouse, along with Paul Epworth, Ryan Tedder, Declan Gaffney and Flood. The good news is, the process of grabbing your free copy is trivial because the album is now available on iTunes and already added to your library, waiting for you to download. 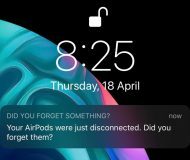 Step 1: Launch the Music app on your iPhone, iPod touch or iPad, either by tapping its icon on the Home screen or pulling down on any Home screen to use Spotlight to search for “Music”. Step 2: Once in the Music app, hit the Albums tab at the bottom (tap More if you don’t see the Albums tab). Scroll through your alphabetically ordered albums to find the newly-added “Songs of Innocence” album. Step 3: You can now tap a track to listen, or tap the iCloud icons to download any individual track or the whole album at once. Some commenters seem to be having problems with download the album through the iOS Music app even though they have “Show All My Music” enabled under the Music section in the Settings app. Luckily, there’s a smart workaround available. Just open the iTunes app on your iOS device and go to Purchased > Music (tap the More tab if you don’t see Purchased at the bottom). Next, do a search for “U2”. You should now be able to re-download the previously “purchased ”album. Another trick: use this iTunes link in mobile Safari on your iPhone, iPod touch or iPad to access the album. Step 1: Launch iTunes on your Mac or Windows PC. 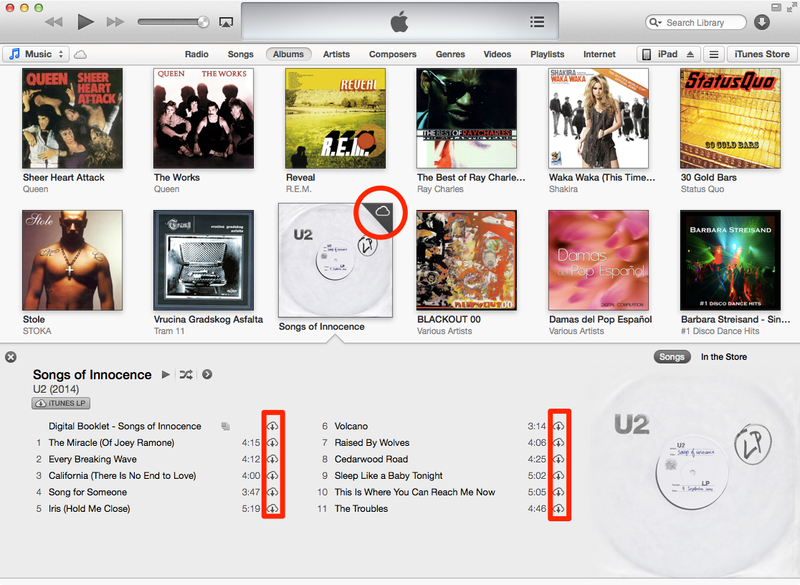 Step 2: Go to the Music section, click the Albums tab and select “Songs of Innocence”. Step 3: You can now select a track to listen or click the iCloud icon to download and save individual tracks or the whole album into the iTunes library on your computer. Downloading the album in iTunes also gets you an accompanying digital booklet. Step 2: Go to Featured Stations and select “Songs of Innocence” to listen. The album will be available for streaming on iTunes Radio starting today, September 10. Step 1: Download the free Beats Music for iOS app in the App Store by following this iTunes link in mobile Safari on your iPhone, iPod touch or iPad. This will open the Beats Music description page in iTunes. Tap the Free button to download the app. Step 2: Open Beats Music on your iPhone, iPod touch or iPad, either by tapping its icon on the Home screen or pulling down on any Home screen to use Spotlight and search for “Beats Music”. 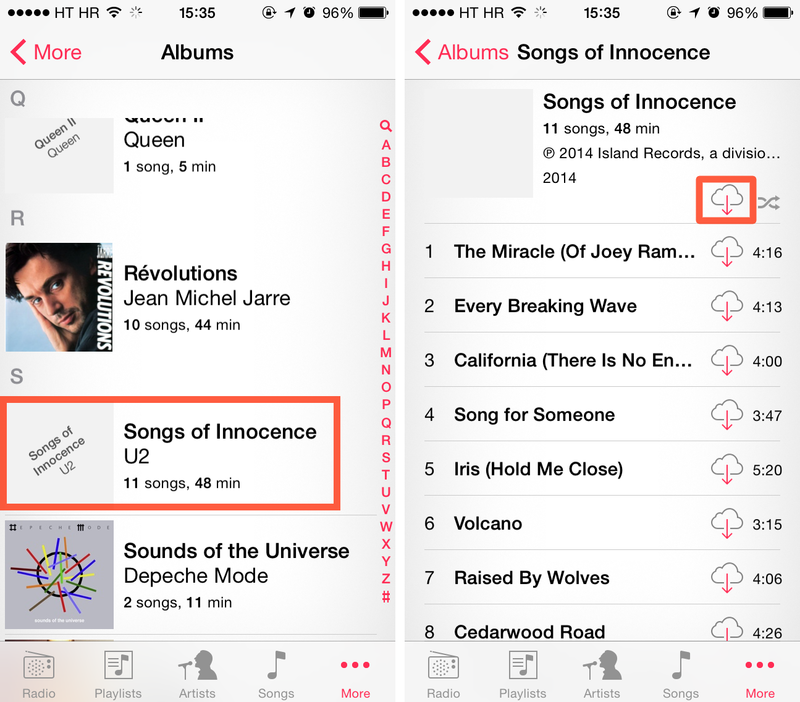 Step 3: Use the search field inside the application to find “Songs of Innocence” and start streaming. The album is available to stream on Beats Music starting today, September 10. 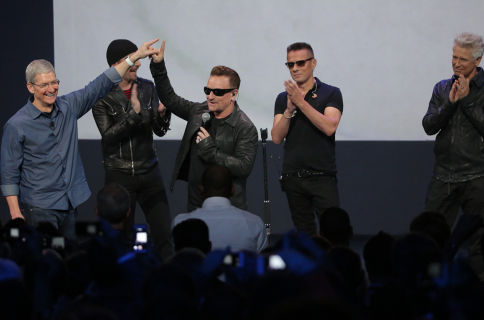 U2 was an important partner for the opening of the iTunes Store in 2003. The iPhone maker worked with U2 again on the iPod U2 Special Edition and creating “The Complete U2” box set together. The Cupertino firm also partners with Bono and (RED) to help fight AIDS by creating (PRODUCT)RED merchandise, having generated more than $75 million thus far for the Global Fund. Again, this is a time-limited offer valid only during the iTunes-exclusive period from September 9 to 11:59pm PDT through October 13 in the 119 countries with the iTunes Store. Even if you’re not a huge fan of the Irish rock band, you should still download this album because, again, it won’t be free forever. Doing so will ensure that you own the album and you’ll be able to stream it from iCloud or re-download it to all your other devices even after the exclusivity windows has ended and the price has gone back up.